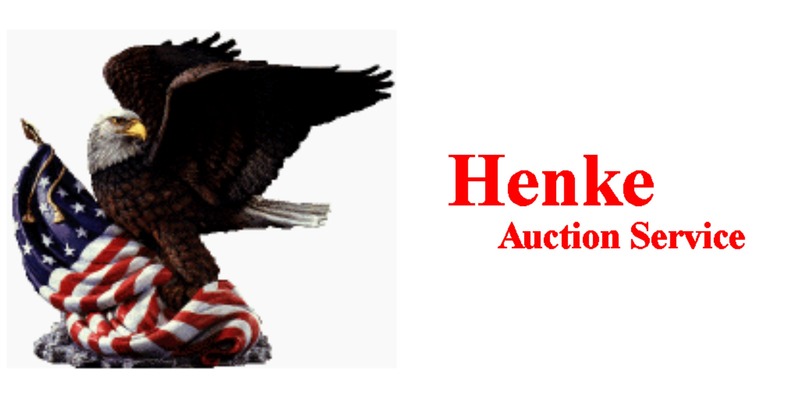 Welcome to Henke Auction Service! Directions: From Mexico– at the Bus. 54-Hwy 54 intersection (by WalMart) go south on Hwy 54 4 miles to ACR 856 (County Line Rd. ), turn left on ACR 856 and go 1.2 mi. to the farm on the left. From Kingdom City, travel north 9.7 mi. to ACR 856, turn right and go 1.2 mi. to the farm. Follow sale signs. Due to the sale of the Buckner farm, the following farm equipment, antiques, and household will be sold at public auction at the above location. Tractor: Massey Ferguson 165 Gas, wide front, 4491 hrs., 16-9-28 tires, rear wts., 3 pt. Misc. Farm Related, Lawn, Garden & Shop Tools: JD 318 Lawnmower, hydrostat, 48″ deck; 7×12 Bumper Hitch Trailer; 4×7 Metal 2-wheel Trailer; Lot Used Corrugated Tin; Lot Used Cedar Line Posts; 14-7’x4″ Treated Line Posts; Apprx. 100 Used Steel Posts-var. lengths; Metal Wheelbarrow; 2 Alum. Dog Boxes; Sev. Partial Rolls Woven Wire; Pine and Oak Used Lumber; Sev. Gates-Alum, Pipe & Wood, var. lengths; Sev. Dbl. Trees, Sngl. Trees & Horse Collars; Misc. Hose Tack incl. a Saddle; Anvil; Lot Shovels, Rakes, Hoes, Post Hole Diggers and Post Drivers; Lawn Spreader; Post Vise; Gas Cans; Rope Wire Stretchers; Ext. Cords; Sm. Floor Jack; 2 Screw-type Basement Jacks; Stihl 025 Chainsaw; Sm. Homelite Chainsaw; Stihl FS55 Gas Weedeater; Stihl HT100 Ext. Limb Saw; Lot of New Oil, Antifreeze; Log Chains; Werner Fiberglas Step Ladder; 300 gal & 150 gal. Fuel Barrels on Stands; 2 Johnson Seahorse Outboard Motors-18 & 3 hp. titles ?other misc. Household: 3 Pc.Wrought Iron Patio Set; Natural Wicker Set-4 arm chairs, glass-top table; Nat. Wicker Rocker; 5 pc. Poly Wicker Porch Set-2 chairs, sofa, side table & coffee table; Desk, Floor Lamp; Elec. Lift Chair; Sanyo & Magnavox TVs; Magnavox VCR; VCR Tapes; Nice Entrance Hall Tree w/upper cabinets; Shark “Professional” UR Vac-like new; Homer Laughlin Blue & White Dishes and other dishes; Bed, Bath & Kitchen Linen; Fireplace Tools; Club Chair; Sofa; Settee (antique? ); Wurlizter Elec. Piano; 2 nice Wingback LR Chairs; Sev. nice Lamp Tables & Lamps; Christmas Decor. ; Material; Dbl. Bed; Bookcases; Very large lot of books of all kinds; Fender Guitar & case; Fishing equip. -rods, reels, etc. ; Other outdoor gear; Sears BB Gun; 8×40 Steinheil Binoculars; and much more! We will begin the sale at 10:00 a.m. with household items and will sell the farm tractor and farm related items at 12:00 noon with the possibility of running two auction rings at that time, so please come prepared! The Buckner family is well-known in the area. It is an honor to conduct their auction. You will find many interesting items in this auction. Plan to spend the day! There will be plenty of parking, weather permitting. Please be considerate of the new owner when parking. Lunch will be available. © 2019 Henke Auction Service. Theme by Anders Norén.